How long since I have abandon this blog? I guess we better skip the I’m-so-sorry part and get right down to business. Yes I’ve been to Bangkok once again, if any of you have guess with me missing in action, and work life has just been busy. So I have to be short here. No matter how much I love to write, sometimes I do agree to some degree that picture speaks louder than words. I have been contemplating for a long time on how to present all the wondrous food of Bangkok that I had in my long-stay two times trip here. There is just so much to talk about from fresh fruits to som-tum to porks (which seems like the main meat here in contrast to Malaysia, where it is the universal white meat – chicken). Nonetheless, chicken will be featured here too of course, albeit in dimmer limelight, but still not forgotten. Here I go again, launching into ranting when I have just said I want to let pictures do the talking. I can’t resist it. I am a writer at heart squeezing in beside my tham-jiaknes. Anyway, for the Bangkok foods, I have tried searching around for proper info in the food I ate, its name and how it was made, but nonetheless, it was too many and much cannot be found on the web. Appreciate if any of you out there knows about it, would drop some comments for all of us to share. As I found out soon, all snacks in Thailand are of 10 baht, equivalent to RM1 in Malaysia. Everything is 10 baht, from fried stuff to ice cream to peanuts and to fruits and to even my favourite coconut. We find it cheap as the portion are usually very generous. 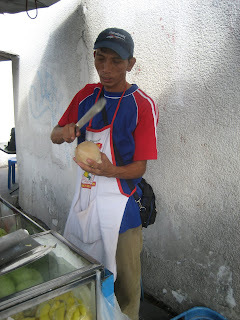 First up is my favourite snack from the street side vendor. 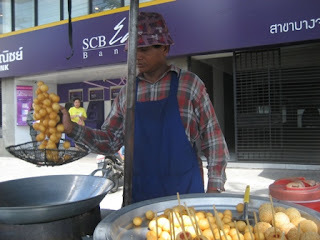 It is called Kanom Kai Noak Garta, which are actually fried sweet potato balls. Crunchy and sweet at the same time, very moreish. 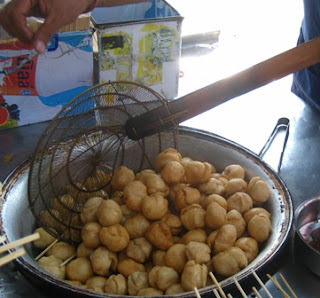 Then we have the Kanom Krok, which is actually coconut pancake, cooked in special pan. It is sweet, for the plain ones, and slightly savoury with the addition of the green onions. I welcome the taste of the spring onions as it brings this tiny little morsels into another level, weighing between sweet and savoury. As I walk along the street after my lunch, I came across a stall grilling bananas. I just had to give it a try as all this while, this lovely fruit appear only as eaten plain, along with my ice creams, or mashed up into my muffins or banana cakes and also hidden in my pancakes sometimes plus sliced finely into my bowl of cereals. But never was it ever grilled and eaten before. We ordered a pack (10 baht of course) to go, and the lady gave a generous douse of palm sugar syrup onto it before handing it to us. The Gluay Ping turn out to be chewier and stickier than I liked. It could get stuck in your teeth and also a bit rough edged (I don’t know how else to explain it). 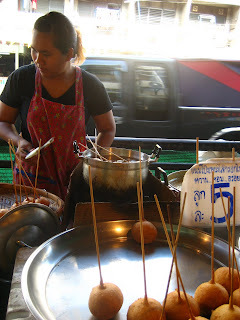 Maybe this stall did not give justice to these Gluay Pings as later, in my next trip, I had a tried on grilled sliced bananas on a stick which was much better, crispy on the outside with sweet and soft interior.. So many sweets, now its time for savoury snacks. 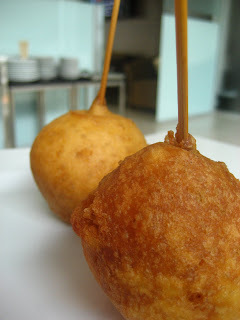 This fried puffed fishballs are certainly one of the best fishballs I’ve ever tasted. I called it puffed, as it is really fluffy with fishy taste. Hard to describe but just one word, good! Then its back to sweet again. 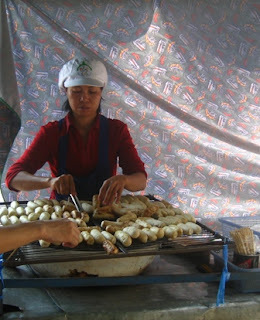 This stall is right outside the street near my hotel, where this lady sells fried sweet bread. It is something of a sight to behold, which is how it attracted me and my colleague one day while we were strolling by. So we went there one fine Sunday morning, just to get it. We bought a stick each, haul it back to our hotel restaurants, like two little girls with a good find of sweets. 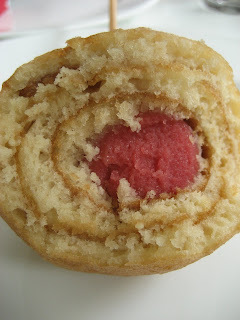 It was really good, soft and sweet cake-like bread, with a surprise in the middle, of all things a sausage ball. Surprisingly, this salty addition was really complementing, and it helped us gobbled up the rest of this gigantic ball. It was that good, my colleague and I bought it again on our second trip, like little girls going back for their treats. 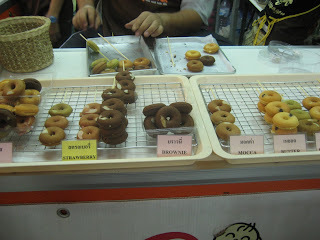 Next up is mini donuts on stick that I stumble upon in one of the many myriad of stalls in Jatujak (certainly a shopping paradise but not one to speak about in a foodblog) and of course with wondrous foods (more to come). These mini donuts are really good, soft and ‘juicy’. The brownie ones are just-enough-chocolatey with chocolate candy bits while the strawberries ones are sweetly-fragrant with bits of strawberry-jam candy here and there. Ah, lovely! With all that heaty yet addictive snacks, I have to wash it all down with my all time favourite Ma Praao. The mini coconuts here area extremely sweet (then again, everything is sweet here, more on that later) and really refreshing. Now I’m missing it already. Here is the guy who’s stall is right outside my office. He’s my source of Ma Praao and various fruits daily!